Wool is naturally grown on the backs of sheep and is an organic compound composed of Keratin (also found in hair, nails and horn). It is categorised as an animal protein fibre, which has a complex and unique structure covered with tiny overlapping scales, all pointing in the same direction. These scales mean that liquid rolls off the surface of the fibre. Even if wool does eventually get wet, it generates heat and keeps the body warm. Raw wool fibres shorn from the animals back are also coated in a grease that contains lanolin and provides natural water resistance. Wool insulates against heat and cold. It is comfortable in both hot and cold weather because it absorbs moisture vapour. In hot weather this absorption/evaporation process works to help keep the body cooler. Wool has a natural wave or crimp that traps air, providing a natural insulating property. During the spinning process the crimps of the fibre wrap around each other, increasing the already excellent tensile strength of the fibre. 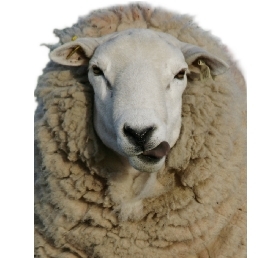 Sheep are a universally domesticated animal and can be separated into two principal types: hair sheep, bred for meat and wool sheep, which can be further sub-divided into different types. The quality of wool is determined by the diameter of the fibre (measured in microns), crimp, yield, colour, and staple strength. The fineness of the wool fibre is the single most important wool characteristic determining quality and price. Subsequent to processing wool is divided into two types of yarn – woollens or worsteds. Of all qualities it is the wool from the Merino sheep that is most prized, it is so important as a wool type that the term has been given brand recognition by both the Australian and the New Zealand wool organisations, creating promotional and advertising campaigns built around the superior attributes and desirability of the fibre, yarn and end product. Any wool finer than 25 microns can be used for clothing, the coarser grades are used for outerwear or rugs. The finer the wool, the softer it is, while coarser grades are more durable and less prone to pilling. The finest Australian and New Zealand Merino wools are known as 1PP, which is the industry recognised benchmark of excellence for Merino wool of 16.9 microns and finer. This type of merino represents the top level of quality in accordance with the original standards of British Wool as applied today by the Australian Wool Exchange (AWEX) Council. Only a few dozen of the millions of bales auctioned every year can be classified and marked 1PP. Botany is Merino wool originating from Botany Bay and is an important marketing label for fine quality knitwear. Other key varieties are: Rambouillet or French Merino, Shetland Wool and Icelandic Wool.